Constellation Research 2018 Artificial Intelligence Study | Constellation Research Inc. This report examines the state of artificial intelligence (AI) investment, development and deployment as well as sources of resistance, potential effects on management and privacy among the first movers, early adopters and fast followers that constitute Constellation's subscriber base. 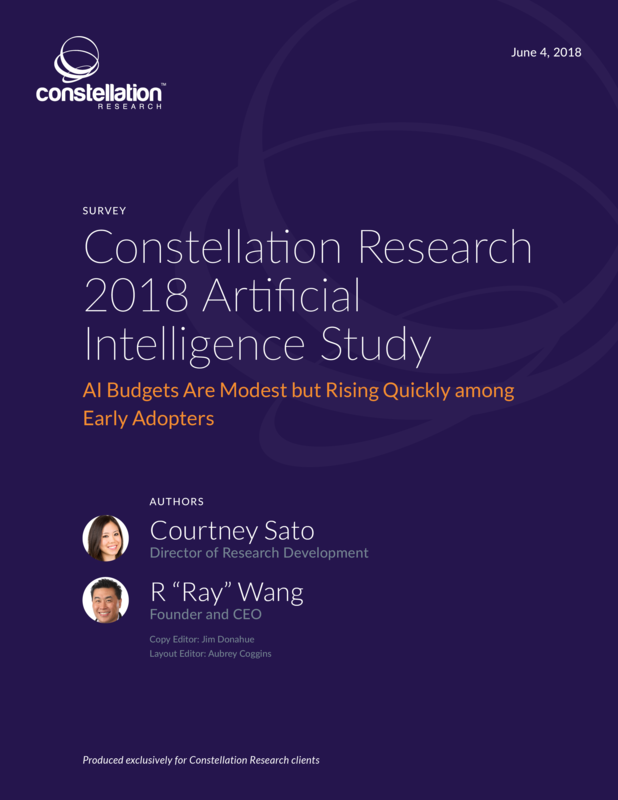 This report leverages findings from the Constellation 2018 Artificial Intelligence Survey, in which Constellation asked C-level survey respondents about the drivers of business investment in AI, AI budgets, progress on AI implementations, business goals for AI, sources of resistance to AI adoption and the impact of AI on the workforce. Fifty C-level respondents completed the survey in January 2018. Responses were collected from Constellation's subscriber base on Constellation's website and ZDNet.com. Open research: download free of charge.